2015 Edison Scholar Athena Chen. 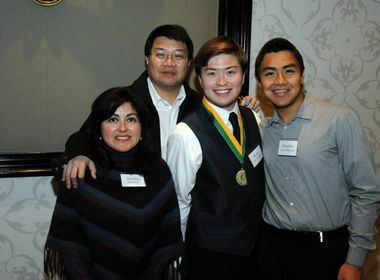 2015 Edison Scholar Athena Chen with her family. Athena Chen pictured at Northwestern University. Athena Chen of Diamond Bar says the $40,000 Edison International scholarship opened the way to college, and now an SCE summer internship. This time last year, Athena Chen was looking to graduate from Diamond Bar High School, yet worried about how to pay for Northwestern University, a private college near Chicago. But by spring, Athena was well on her way to graduating and her worries about tuition were solved when she won a $40,000 Edison Scholars award, sponsored by Edison International, parent company of Southern California Edison. “It is so great to be going to college and not have to worry about working part time and finances,” she said by phone from Northwestern, where she just started her second quarter. The help from Edison International, however, didn’t end with the scholarship. After school started in the fall, SCE contacted Athena about applying for one of this year’s summer internships. Athena recently learned she was accepted for one of the coveted internships. She will go to work for SCE in June in analytics and reporting, a field related to her applied mathematics studies. 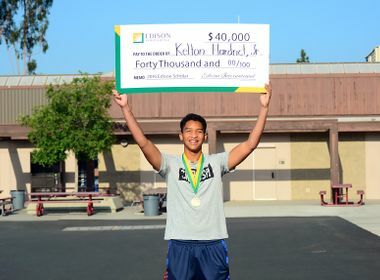 Looking at the opportunities her Edison Scholars award presented, Athena urged current high school seniors to make sure they get their applications in for one of this year’s 30 scholarships by the Feb. 1 deadline. Eligible applicants must live or attend high school in SCE’s territory and plan to major in electrical engineering, civil engineering, computer engineering, industrial engineering, computer science/information systems, environmental engineering or environmental sciences at a four-year college. Applicants must have at least a 3.0 GPA and be able to demonstrate financial need. Scholarship recipients will be announced in April. Competition is stiff — last year 2,768 high school seniors applied for the 30 scholarships — but citing her own experience, Athena said students shouldn’t be deterred.